The three friends are sitting in a bar, slightly drunk, after a night of revelry. One of them starts talking about the peculiar tune that accompanied the Doordarshan logo before the 9 o'clock news. This is followed by a session of out-of-tune humming. "I feel like I'm in school," says the stickler-for-perfection, workaholic Arjun (Roshan), "and the vacations are coming to an end." The other two, Imran (Akhtar) and Kabir (Deol), look back amazed. This was the guy who was reluctant to go on holiday in the first place. Married to his profession, stuck to his phone, Arjun carried a laptop to the road trip in Spain so he could keep in touch with "clients". Carrying deep resentment against his friend (Imran), dealing with a break up, and driven by a single-point agenda - to make enough money so he can retire at 40 - Arjun is a somewhat different person towards the end of the trip. Zindagi Na Milegi Dobara (ZNMD) is not everyone's cup of tea. It trudges along at a leisurely pace, does not have a 'story' to boast of, and relies on moments more than their sum total. It's more of an experience, if I can say so, than a storytelling exercise. And you'll enjoy it if you have the stomach for it. I did. On the other hand, the pace (or the lack of it) may irritate those who like things to "happen" in films. Zoya, as in her debut Luck By Chance, adopts an understated approach, letting her characters connect on their own rather than thrusting them on audiences. The nicely done title sequence, showing the three friends going about packing before embarking on the trip, brings out more about the characters than the dialogues they speak. Call it inspiration, or mere co-incidence, but ZNMD reminded me a lot of Sofia Coppola's Somewhere, about a mercurial actor bonding with his daughter on a vacation. The story telling technique was similar; so was the tempo, and the beauty lay in little moments shared between father-daughter over, say, breakfast where not much was spoken. In ZNMD too, the best sequences are those that have no, or very little, dialogue. Like Arjun breaking down after having explored the underwater world of corals and sea animals in spite of a fear of drowning. Or the scene showing the three friends skydiving. This one's a long sequence, starting with Imran's trepidation before jumping off, to the point all three friends touch down. Along the way you share the fear, then thrill, then ecstasy the three friends are shown to be experiencing. Kabir's issues are not on the surface either. He's the most affable of the three, with the least baggage probably, and extremely friendly. But he won't discuss his love life even with two of his oldest buddies. Grown men don't talk about personal things. Kabir's no different. 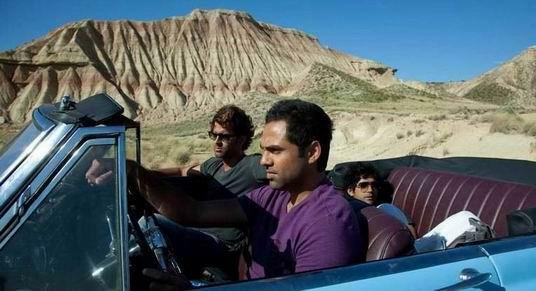 ZNMD doesn't resort to the usual backslapping you associate buddy films with. The similarity to the banner's earlier Dil Chahta Hai begins with it being about three friends and ends with the unexplained affluence of characters in both films. In the Akhtar world, it seems, everyone's rich. A decade ago, dashing off to Goa on an impulse seemed like a 'not-very-middle-class' thing to do, while not many Indians would be able to afford a three week bachelor trip to Spain unless they're well-off. But that apart, the issues the three men deal with in ZNMD are slightly more complex than those faced by Akash, Sid and Sameer in DCH. The latter was about clueless youth fresh-out-college and trying to find their feet in the real world, while ZNMD is about men on the cusp of a mid-life crisis. Along with cinematographer Carlos Catalan, Zoya makes the film a visual treat, letting the sights and sounds of Spain do more than just provide a scenic backdrop. Shankar-Ehsaan-Loy's music is hummable, while Javed Akhtar's lyrics deserve special mention. 'Khwabon ke parindey' is an absolute joy to listen to for Akhtar's magical words and Alyssa Mendonsa's soulful rendition. Farhan Akhtar infuses the script with witty dialogues, keeping some good ones for his own character. But after a point, Farhan does grate on your nerves only because a more charming, truly funny actor could have worked wonders. He can direct, he can write even better, but as actor Farhan is strictly ho-hum. If I would have to go on a road trip with any of the three guys, I would want to drop him from the group first. Hrithik, on the other hand, performs a role diametrically opposite to the one you expect to see him in. He is no 'hero'; just a regular guy dealing with issues any thirty year old could be faced with. He's extremely restrained and lovable. As the girl who acts as the catalyst for Arjun's transformation, Katrina is wonderfully charming as Laila. I have never liked Katrina before in a film as much as in ZNMD. Call it inspired casting, but she just fits to the T. Kalki is very real as Kabir's possessive fiancee; she'll remind you of similar women you may have come across at some point or the other. Abhay impresses the most, bringing a lot of himself to Kabir's character, keeping things subtle but managing to stand out among the three. The beauty of the casting is that it's a mainstream set-up, but without the trappings of a regular Hindi film. The real hero, for me, is Zoya Akhtar. ZNMD may not be the best thing to happen to our movies, but it's a lot better than many multistarrer films we see week after week. It has the stars yes, the locales, the budget etc. But, more importantly, it has soul.